If you took a trip around Australia and are directed to the second largest city - Melbourne, there is no way that you could miss one of the most inspiring natural beauty of the continent. The Twelve Apostles is a beautiful natural phenomenon that represents a group of rock formations, standing amidst the waves of the Australian coast itself. 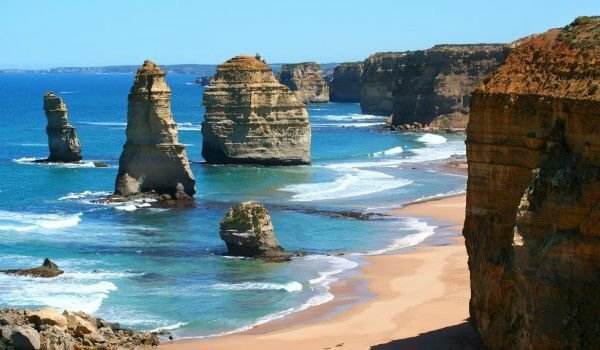 To travel the beautiful scenic route along the ocean - Great Ocean Road, it will first take you to the Apollo Bay, where the starting point is for the Twelve Apostles. Twelve Apostles is a collection of eight limestone rocks, which protrude from the water within the Port Campbell National Park, in which is the Australian state of Victoria. The proximity of these huge single rocks in the middle of the water is the reason for their popularity as an inspiring landmark. The Rock Ensemble of Twelve Apostles is located on the road to the, Great Ocean Road, just between Prince town and Peterborough. The area of the twelve apostle was developed into a modern tourist area, given protected natural areas of the local beautiful Australian coast. The options for the tourists are pretty. For their convenience one can best cater to the tourist center at the Twelve Apostles, which is located inside the Great Ocean Road. Everywhere are built nice routes and trails for visitors who want to reach out to enjoy the beauty of the Twelve Apostles. Among the options to be addressed of the natural landmark is the helicopter air tour, also organized by the Victoria tourist center. There, is aalso the handy built car park and observation platform. From the rock miracles of the Twelve Apostles are now only eight that remain strong, this is due to erosion of the soft limestone rocks that are in constant contact with salty sea water, wind and sun. The formation of the natural phenomenon, Twelve Apostles started centuries and centuries ago. The stormiest ever wind of the Southern Ocean gradually undermining the soft limestone rocks, eventually formed prettycaves. Over time the influence of natural forces gradually caves form the arches, which in the course of further erosion collapses which causes separation resulting in isolated rocks, known today as the Twelve Apostles. The maximum height of the Twelve Apostles is 45 meters. The tourists should try to make sure they admire a sunrise or sunset. Such natural phenomena is particularly beautiful when the sun stays low on the horizon.